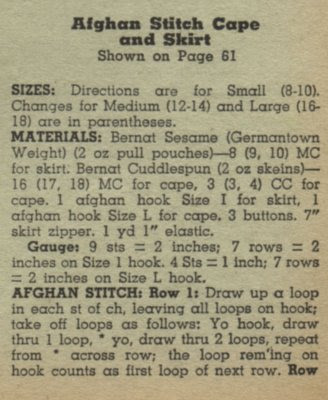 Also in that first issue of Good Housekeeping Needlecraft magazine (Fall-Winter, 1968-1969), this crocheted cape and skirt set. What I love about this set is that it's a lovely bridge between the New Look fashions and mod swinging styles. It's classic and rather iconic vintage without looking "frumpy" or "too futuristic" -- everything a vintage fashion ensemble (and wardrobe building pieces) should be. Hi: I went ahead and sent the pattern to several of my friends and then I happened to notice that the pattern wasn't complete. Do you have the rest of it? It is complete -- there's just part of another set of instructions there (last scan, second column, "blue suit" instructions" should be ignored). I just double-checked with the magazine to be absolutely certain. I should have cropped that out; I meant to but forgot. But come on back now, y'all!